In recent years numerous exhibitions have been mounted on the subject of "art and music." The Chicago Museum of Art's 2007 show "Sympathy for the Devil: Art and Rock and Roll Since 1967" was an excellent example that explored the cultural and social crossovers between art and music and the stylistic effects they have had on each other. "Looking at Music," a current exhibition at the Museum of Modern Art (curated by Associate Curator of Media Arts Barbara London), also looks at these cultural synergies but illuminates them further by focusing on the structural and theoretical connections between not only music and art, but also writing, filmmaking and performance. By starting in the early 1960s, the show focuses on a time when the very nature of art was in flux, new forms of writing were emerging, new technologies were pushing the boundaries of moving image and sound recordings, and social attitudes about self expression and gender were radically changing the cultural landscape. When walking into the exhibition space the viewer is greeted by the reassuringly happy face of John Lennon. He is the subject of Film No. 5 by Yoko Ono, and his beatific image does more than introduce us to the show's themes of intertextuality, identity politics, minimalism and process. As the subject of a film by his Fluxus artist wife, Lennon's face also refreshingly highlights the role of women in this important period of art history. In addition to Film No. 5, included in near-by vitrines are Ono's famous Fluxus book of instructions Grapefruit, and the artist's multiple Fly, presented here as a collection of printed words on tissue paper and other detritus such as rocks and acorns. These printed works serve to illustrate the range of Ono's mixed media experimentation. Laurie Anderson, another widely known figure from the period, is likewise represented through her work in multiple mediums. Most prominent is the succinctly titled Self-Playing Violin (1974) (a violin kitted out with a playback device and speakers) that grants her the ability to "play" any piece of music, as well as be her own best accompanist. Her concerns in exploring technology, performance and audience are illustrated across platforms, and a number of small books and notebooks (also displayed in the vitrines) reveal her written scores, poetic notation systems and documentation of performances using instruments like the Self-Playing Violin. 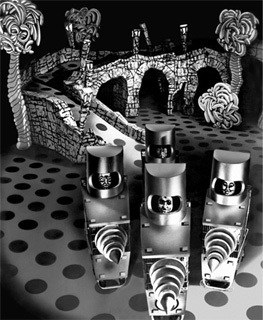 Moving image documentation from E.A.T. 's (Experiments in Art and Technology) infamous 9 Evenings in Art and Technology highlights an important audio work from another notable female artist -- Lucinda Childs. This 1966 event at the 69th Regiment Armory in New York paired technicians and scientists from the Bell Labs with some of the most innovative artists of the period. For the performance Vehicle, Childs created an proto 'audio installation' by combining her experience as a dancer and choreographer with experimental audio technologies like sonar. The importance of 9 Evenings is more commonly associated with the participation of like of Robert Rauschenberg and John Cage. As a result, it is a refreshing curatorial choice to see the often overlooked Childs within this context. 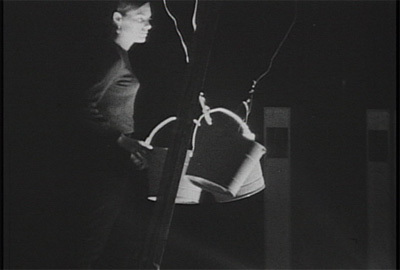 The inclusion of Joan Jonas embodies another predominant theme in "Looking at Music" -- meditation on ideas of 'self' and the role of the artist in work from the 1960s and 70s. In Organic Honey's Visual Telepathy (1973), Jonas shed her own identity and takes on the alter ego 'Organic Honey.' Through a process of singing and carefully choreographed masking and unmasking of herself (as 'Organic Honey'), Jonas illustrates that the term "mixed media" was not just a formal categorization, but could be applied in a personal sense. Of course, no show about mixed media art in the 1960s would be complete without at least one piece by Nam June Paik, and "Looking at Music" obliges us with two. Formally trained as a musician, Paik's career was predicated on the structural connections between music, art and technology. Untitled (1968), a small television sculpture by Paik and the German artist Otto Piene, displays on its screen a diagonal frequency or single 'note,' similar to many of Paik's early television experiments. Piene decorated the monitor casing with plastic beads creating a hybrid sculpture, music and video piece. Klavierduett: In memoriam George Maciunas is a jewel of a recording by Paik and Joseph Beuys. Although made much later in 1982 (after Maciunas' death), the combination of George Gershwin's Summertime sung over a Chopin sonata exemplifies the often humorous results of these intensive cross fertilizations. Works on paper figure largely in the show and draw connections between wide ranging mediums. The influence of John Cage looms large throughout "Looking at Music" and he is represented through two works that confirm his auditory and visual influence over the art of the period. Rows of numbers with hand written annotations reveal the mathematical and chance processes (by way of the I Ching) that guided Cage and many others artists at the time. These and other works on paper installed throughout the space provide a unique and unifying thread through the show. For example, Drawing on newsprint (Village Voice) with printed Walking Woman silhouette. February 4, 1965 (1965), by Structuralist filmmaker Michael Snow hints at the similarities between Structuralist film and collage, and two collages by mail artist Ray Johnson allude to experimentation in art distribution as well as art production. The inclusion of a few issues of the publication Avalanche is also informative. Beautifully designed and wide ranging in its theoretical scope, Avalanche magazine was a relatively short lived (1970-75) but extremely influential publication that defied the limitations of mass-produced print media. The brilliant pairing of Steve Reich and Bruce Nauman sheds light on one very specific structural technique of the era -- phasing. Revered minimalist composer Reich experimented with this notion (wherein two instruments shift in and out of unison) through a number of influential compositions, notably Piano Phase (1967) and Clapping Music (1972). While the viewer (in this instance listener) can both listen to a recording and see the album cover, it is Bruce Nauman's video Lip Sync (1969) that renders the idea of phasing visual. 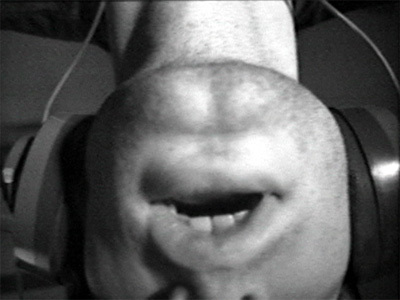 The video shows the artist's head upside down with headphones on, repeating the words "lip sync." The sound and the movement of his lips gradually move in and out of synch as he attempts to simultaneously recite and listen to the phrase "lip sync." The rest of the exhibition connects the thus far esoteric themes of the avant-garde to pop culture. John Lennon reemerges not as the subject of his wife's films but as musician, director, and actor in the music video/short film of The Beatles' Penny Lane. Coupled with David Bowie's glorious and sexually ambiguous Space Oddity, the music videos remind us that non-linear narratives, identity politics and experimentation weren’t the sole territory of the avant-garde. The rest of the videos drift back towards the esoteric, but retain the basic structure of the MTV style music video. Captain Beefheart's highly experimental video for Lick My Decals Off, Baby could be seen as precursor to the performance videos of Nauman, and the video's structure and feedback loops refer back to Paik's experimentations. The bizarre narratives that play out in the last two videos: The Residents' Third Reich 'n' Roll and Devo's Secret Agent Man interject an element of the theatrical to the mix. One shortcoming of "Looking at Music" is the relative inaccessibility of the screenings. More a product of MoMA's limited exhibition space and structure than a curatorial oversight, the excellent screening series, organized by London and Hanne Mugaas, enhances the premise of the show immensely. By including Structuralist films by Michael Snow and Tony Conrad, films by Jack Smith, Laurie Anderson, as well as works by a younger group of artists such as Cory Arcangel, Seth Price and A ïda Ruilova we see the range of structural connections that continue to be made between mediums. Unfortunately, these screenings were only scheduled through August and September. This week, however, MoMA's theaters will put into focus the important historical context from which this show draws. People will have the rare opportunity to see the 9 Evenings Theater and Engineering film on the large screen (clips can be seen via the Daniel Langlois Foundation website), and hear from participants Julie Martin and Robert Whitman as part of a panel discussion on October 2nd. Fully Awake: Black Mountain College Experience, a new film directed by Cathryn Zommer and Neeley House, looks at the remarkably holistic approach to art making taught at the legendary Black Mountain College outside of Asheville, NC where Bauhaus alumni mingled with an emerging American avant-garde. From painter Wasily Kandinsky to filmmaker Oskar Fischinger, from John to Yoko, and even from Sonic Youth to Bjork, it is clear that the relationship between visual art and music has been a fruitful one. And by underscoring the structural experimentation between them "Looking at Music" has elevated the discourse surrounding both. Currently a freelance curator and researcher, and also a writer for Rhizome.org, Caitlin Jones was formerly the Director of Programming at the Bryce Wolkowitz Gallery in New York, NY. Prior to this, Jones held a combined curatorial and conservation position at the Solomon R. Guggenheim Museum. At the Guggenheim, she co-curated the groundbreaking exhibition "Seeing Double: Emulation in Theory and Practice" and coordinated the Deutsche Guggenheim exhibition, "Nam June Paik: Global Groove 2004." As a key member of the Variable Media Network, Caitlin has also been responsible for developing important tools and policy for the preservation of electronic and ephemeral artworks. In addition to her work for Rhizome, her writings have appeared in a wide range of exhibition catalogs, periodicals and other international publications.